Pike Place Market is by far my most favorite place in Seattle. No doubt I'll dedicate at least one future blog post to this epicurean delight, but for today, let's focus on what I found at Manzo Brothers Fruit & Vegetables in the Main Arcade: GARLIC SPEARS! 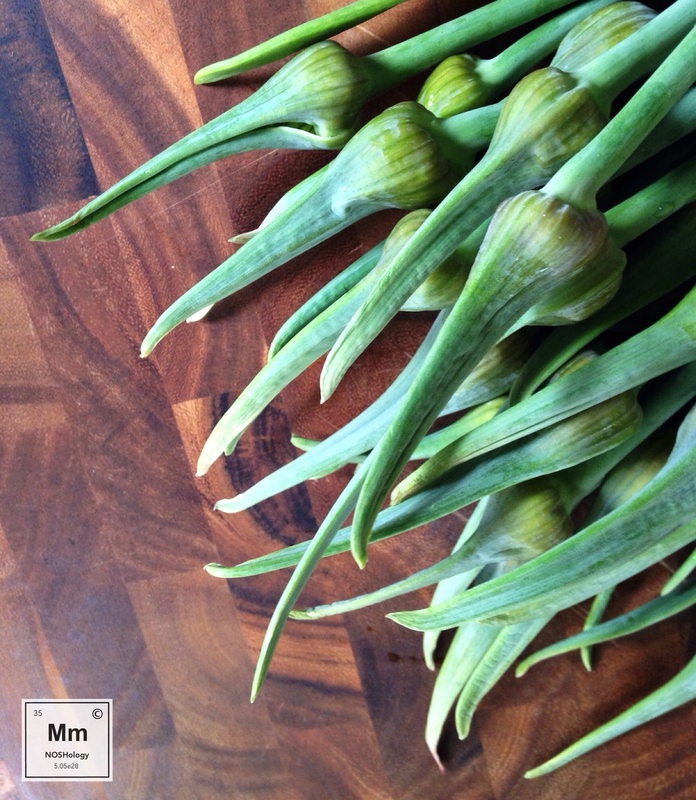 Garlic spears, also known by the moniker "scape," are the flower stalks of elephant garlic. Harvested early, they have a texture similar to asparagus and add a peppery, garlicky (duh) bite to recipes which mellows the longer the spear is cooked. Upon arrival at Casa NOSH, I sautéed several stalks in a manner similar to how one might prepare asparagus: a little olive oil, sour squeeze of fragrant lemon, finished with Maldon sea salt after about 15-20 minutes. 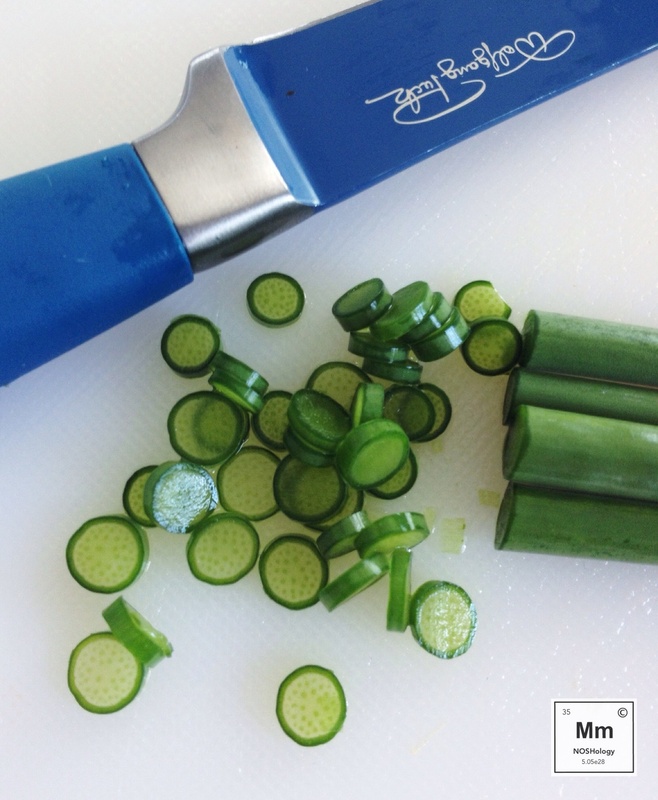 A little on the firm side, the texture was similar to asparagus but with an okra glide across the tongue. Their flavor was delicate, but definitely garlicky...almost as if I had roasted asparagus in garlic oil. Win! The next day, I cut up some spears into 1.5 inch pieces and tossed them into a pan with some olive oil. After about five minutes, I added some hastily-chopped sweet red bell pepper (the aroma produced by garlic spears is known to induce hunger), then a few minutes later tossed in some diced Roma tomatoes. Before serving, I plucked some fresh oregano and basil from my windowsill garden and tossed it all together with mini farfalle, hastily ground some black pepper over the top, pinch of kosher salt, and devoured the lot. Two days after purchasing the spears, I decided to go off-book and slice them ever-so-thinly (look at the beautiful pattern in the stem!) before placing them into a bowl containing canned white albacore tuna, scallions, mayo, and cayenne pepper, finishing the mix with a dusting of Northwest Alder smoked salt. As pedestrian as it may seem, this was my favorite use of the spears, as evidenced by my repeating experiment three twice until, sadly, the stalks were gone.